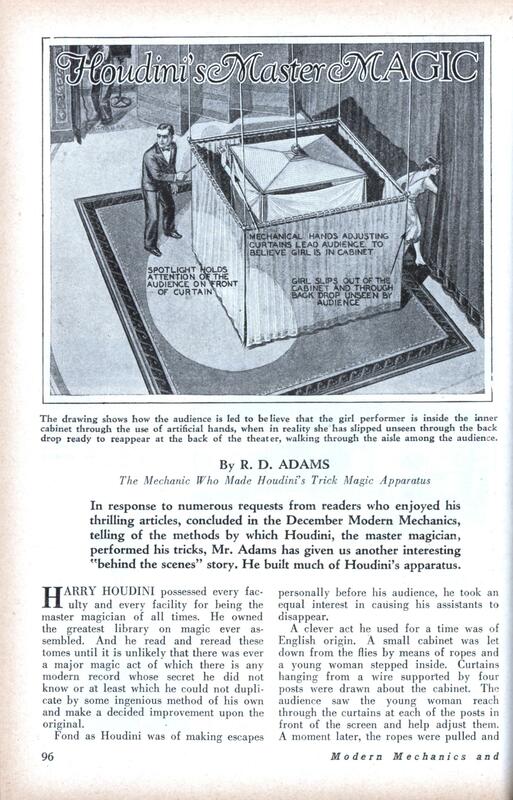 The Mechanic Who Made Houdinis Trick Magic Apparatus In response to numerous requests from readers who enjoyed his thrilling articles, concluded in the December Modern Mechanics, telling of the methods by which Houdini, the master magician, performed his tricks, Mr. Adams has given us another interesting “behind the scenes” story. 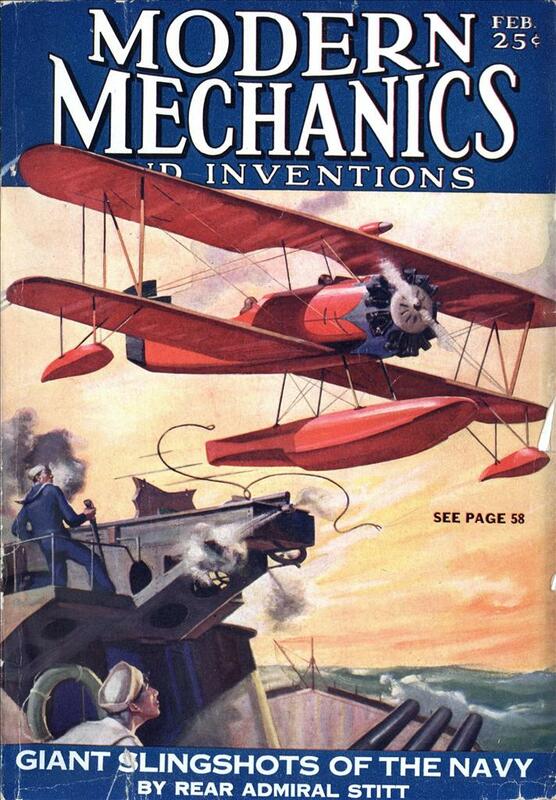 He built much of Houdini’s apparatus. HARRY HOUDINI possessed every faculty and every facility for being the master magician of all times. He owned the greatest library on magic ever assembled. And he read and reread these tomes until it is unlikely that there was ever a major magic act of which there is any modern record whose secret he did not know or at least which he could not duplicate by some ingenious method of his own and make a decided improvement upon the original. Fond as Houdini was of making escapes personally before his audience, he took an equal interest in causing his assistants to disappear. A clever act he used for a time was of English origin. A small cabinet was let down from the flies by means of ropes and a young woman stepped inside. Curtains hanging from a wire supported by four posts were drawn about the cabinet. The audience saw the young woman reach through the curtains at each of the posts in front of the screen and help adjust them. A moment later, the ropes were pulled and the screen, which plainly had no flooring in it, was whisked up above the stage. Again the hands were seen apparently readjusting the curtains around the cabinet. Then Houdini fired a pistol and the curtains fell to the floor. The girl had vanished. Where was she? She answered the question herself almost instantly. “Here I am,” she cried gaily as she walked down the theater aisle displaying 011 her wrist the signature of a committeeman, which had been placed there at the beginning of the performance to prove that a “double” had not been used. How did she vanish? There was a heavy rug on the floor which showed no trap door was used. She could not possibly have clung to the interior of the screen and been lifted into the flies. And if she had done so, she could not have gotten out and down into the theater aisle so quickly. Like all the others, the trick is simple enough once the method is known. The first time the hands appeared to adjust the curtains quite ostentatiously, they were those of the young lady. But immediately after they were drawn back, she stepped around the screen and vanished back stage through a slit in the drop, her exit being hidden by the curtain and screens. The hands that were seen at the curtains after the screen was hoisted were artificial. Fine silk lines made invisible against the dark background and operated from the flies caused the artificial hands to move as if adjusting the curtains and then to disappear behind the posts so they would be invisible when the curtains dropped. When Houdini saw his assistant at the rear of the theater ready to rush down the aisles, he fired the pistol for the removal of the cur- tains and the illusion was complete. The last time I was with Houdini, he outlined a new trick he had in mind and asked me to make him a model of the simple contraption needed to make it possible. Here is the trick as it would have been worked had his plans been carried out: A long table would have been placed in the center of the stage and a wide plank with hooks at each corner would have been placed across it. A young woman would have lain down on the plank and a thin piece of cloth been thrown over her in such a fashion that the body outline would have been clearly visible to the audience. Then the plank would have been raised a few feet from the table by means of ropes let down from the flies, the table would have been trundled off the stage by an assistant, a shot would have been fired, the plank lowered again to its original level, the cloth removed and the young lady would not be found beneath it. Instead she would be rushing down the aisle calling, “here I am,” as in the act just described. And it undoubtedly would have been a most mystifying performance—this disappearance from a plank suspended in midair and nothing above, below, or at the sides of it to veil her escape. As a matter of fact, however, she would not have been on the plank when it was elevated above the table. As the cloth was being thrown over her, she would have rolled out on a shelf at the rear of the table and been trundled out with it. A portion of the top of the plank would have been covered with light canvas so stained that the audience would not have detected the deception. Beneath this canvas, held tight by elastic but so arranged that it would give at the slightest pressure, a set of springs would have bulged up so as to create the impression that the audience could see the outline of the girl’s feet and torso beneath the light covering thrown over the plank. When the shot was fired, a jerk from an invisible cord would have released a trigger causing the bulging springs to snap back into position and the top of the plank to appear smooth and level. Another stunt was the escape from a paper bag. Houdini was enclosed in a bag after which the opening was tied and sealed so that it could not be opened from the inside without certain detection. The moment he was trundled behind the screen where he made all his escapes, Houdini took a razor blade from his pocket and drew it at an angle across one wall of his paper prison. Stepping out, he reached” into one of the secret compartments of his screen where there is transparent mending tissue and a flat iron. Placing the tissue carefully inside the slit, he fitted the paper tightly together, warmed the iron over an alcohol lamp if he did not have an electrical one available, smoothed out all wrinkles perfectly and returned before the audience. The committee members inspect the bag. Strangely enough they invariably devote practically all their attention to ascertaining whether the bag is sealed as it was when they last saw it, satisfy themselves that such is the case, give a cursory glance at the rest of the sack and finding no gaping holes therein, shake their respective heads solemnly and depart convinced along with the rest of the audience that Houdini is a phantom. An old trick which Houdini revived was that of “threading” a package of needles in his mouth. Houdini’s method of presenting the act was to place in his mouth a number of needles, one at a time, then draw through his lips a long piece of thread. A few minutes later after which he had stalled with appropriate movements of his facial muscles to indicate he was forcing the thread through the elusive eyes of the tiny bits of steel, he drew out slowly before his bewildered audience a thread so long that an assistant had to take hold of one end of it long before it had all passed through his lips. On it at irregular intervals were threaded 150 to 175 needles. The long strand of threaded needles neatly rolled together had been secreted carefully between his jaw and cheek. As he took the loose needles in his mouth, he worked them down on the other side of his jaw where his dexterous tongue also forced the piece of thread the audience saw him take into his mouth. His agile fingers removed the loose needles and thread, which he palmed, as he started to draw forth the threaded needles. On at least one occasion, the performance of the first illusion described was an embarassing failure. The girl slipped out through the curtains in the normal way. She then had to exit the theatre through the rear stage door, quickly circle round to the front and make her way to the back of the auditorium, from where she could reveal herself to the audience. However, on this occasion, the large theatre they were performing in had more than one auditorium, the girl entered the wrong one, and came running down the aisle loudly shouting ‘here I am!’ during a performance of some deep stygian drama, to a very perplexed audience.